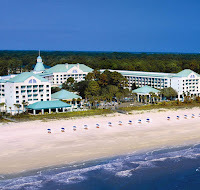 Sitting upon a wide stretch of pristine sand beach amongst acres of lush landscaping, The Westin Hilton Head Island Resort & Spa is a premier escape destination where modern luxury is accented by traditional Southern charm. The resort is home to Westin's new spa brand - 'Heavenly Spa'. The experience offers guests a modern, yet simplistic architectural elements designed to enjoy the relaxing sanctuaries and alcoves complimented by soothing sounds and water features throughout the 8,000 square-foot facility.